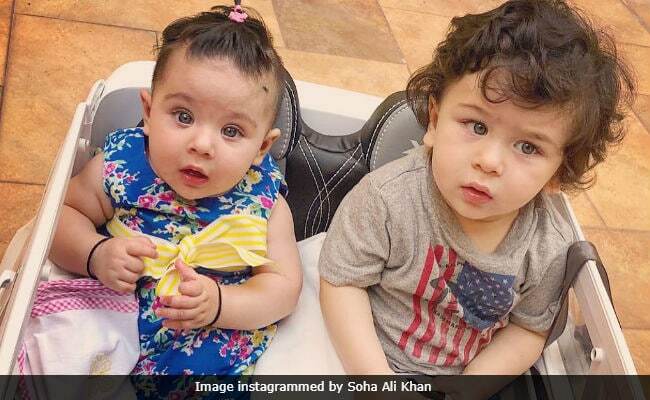 What you're about to see may just be the cutest pictures of Taimur Ali Khan and his cousin Inaaya. Kareena Kapoor and Soha Ali Khan got together with their toddlers and it was a sight to behold. Taimur and Inaaya, who can pass off as twins, seemed to have had a fabulous time together carpooling and vying for their mothers' attention. Soha shared a picture of Taimur and Inaaya seated in a toy car and their expressions are just priceless. In another picture, Soha and Kareena held on to Inaaya and Taimur, respectively and again their expressions were priceless. Thank you, Soha, for these fabulous pictures. Now, Soha Ali Khan did reveal last month that Taimur's father Saif Ali Khan gets worried every time Taimur gets near Inaaya, but today was not the case. She told DNA: "Taimur is at an age where he wants to explore everything. He is now able to hold things, his grip is getting stronger. He is also into snatching things and throwing them away. Inaaya is too small now and so we are constantly scared to have them too close to each other. Especially Bhai gets really worried whenever Taimur tries to get closer to where Inaaya is." Soha Ali Khan recently became a published author as her biography - The Perils Of Being Moderately Famous - hit the shelves. Soha is currently filming Saheb Biwi Aur Gangster 3, co-starring Sanjay Dutt and Chitrangada Singh. Kareena Kapoor Khan is awaiting the release of Veere Di Wedding, which also features Sonam Kapoor and Swara Bhasker.